Mc Donald’s India has been repeatedly coming up with some real innovative campaigns. 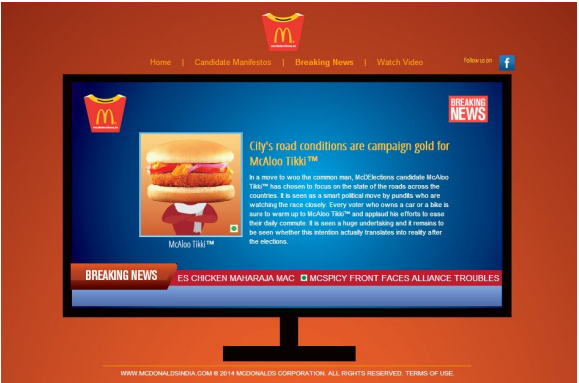 This time round, keeping pace with the mood of the nation, Mc Donald’s India launched its new campaign- #McDElections with the election theme to attract the audience attention and launch its new burger variants. 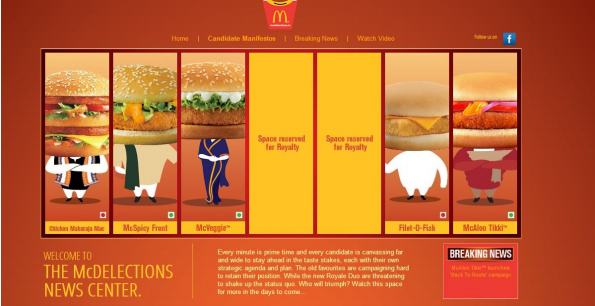 #McDElections is an online campaign launched by Mc Donald’s India to emulate the elections fever in order to introduce its new burger variants- Grilled Chicken Royale and Mc Paneer Royale. A dedicated website was launched resembling the TV show debate format with election debates and appeals by candidates. The first glimpse of the website summarizes the gist of the campaign, a video that talks of the campaign motive; a news channel debate with election candidates. In this case, the candidates being the burger variants- Chicken Maharaja MC, MC Spicy Front, Mc Veggie, Fillet-O-Fish and MC Aloo Tikki. The underline of the video campaign is the creating a tempting image of the new variants by comparing it with the old ones. In the campaign, each candidate has their own unique foodie manifesto, debating why he is better. To add more relevance and credibility, the caricatures of candidates resemble popular Indian politicians. 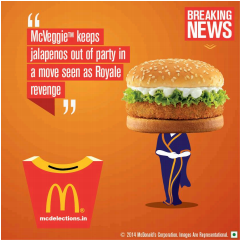 The website content has been further endorsed in snippets on the official Facebook page of Mc Donald’s India, by creating a ‘Vote appeal’ ad look to it. The campaign adapts the current mood of the nation, that being its biggest positive. The adaptation of the idea is brilliant and highly innovative. Being one of a kind, it is one of the firsts in its fields, which also ups the interest value. The caricatures of real life politicians make it interesting and relevant. However, the personification of popular burgers only makes the campaign more delicious with a sense of humor to it. Also, going by its given format, the campaign creates the much needed hype for its new products to be introduced. Mc Donald’s has been missing on a lot of coverage and viral campaigning possibilities due to its twitter absence. The dedicated website and the FB campaign could do better with a more aggressive promotion of the campaign. While the campaign is intriguing and entertaining, it lacks the element of audience engagement. The campaign suggests a larger idea, but fails to provide the ultimate objective. The concept has a lot underutilized potential. However, it needs a hook to interest the audience. #McDElections is a brilliant concept that is served half cooked on the platter. The potential of the campaign builds up a lot of excitement, only to be disappointed by the lack of its interactive approach towards customers. However, it is an interesting campaign initiative to grab attention. Bravo to Mc D’s for their #McDelections theme and execution.